Epiphany, or, Dia de los Tres Reyes. 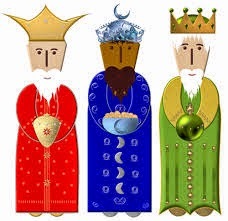 January 6 is Epiphany, marking the end of the twelve days of Christmas and commemorating the visit of the three kings, or wise men, or magi, to the infant Jesus, bearing gifts of gold, frankincense, and myrrh. It is an important feast day in the Roman Catholic, Anglican, and Protestant traditions. In Eastern Orthodoxy, it is also celebrated as the date of Jesus' baptism, and considered more important than Christmas. In some Spanish speaking countries it is an especially joyous occasion. The video clip above, courtesy of Conociendo a Puerto Rico, shows the celebration in the city of Mayaguez. There are three costumed "kings" in front of whom children pose for photos and, of course, lively music.